The 2018 season is under way with some very well attended competitions – especially the January mixed which attracted the maximum entry. Can’t say the same for last Thursday’s Alliance which was “cancelled due to good weather” (I’m joking, of course!) I reckon the few ladies who played in 40 deg+ temperatures deserve a bravery award…and, possibly, medical treatment. Following Vanessa Cloete’s recent resignation as ladies’ secretary, I have volunteered to fill the gap at least until our AGM in August. As I’m already writing the newsletter & organising social events, it seems logical! Our next competition (Thursday 15th) is our Valentine’s event – so celebrate by wearing some red or pink! The Poster for Oubaai ladies day has already been sent to you, along with details of Knysna’s ladies day on March 15th. Please note that all entries must be made via email – there will be no list in the locker room. 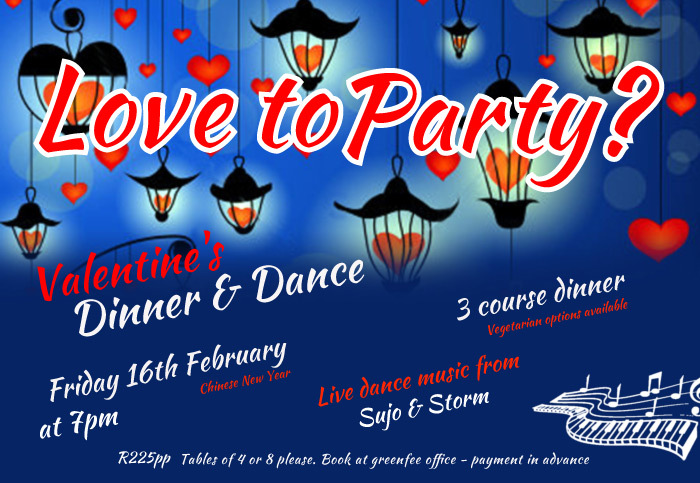 This Friday sees our first big social event of the year – a Valentine’s dinner/dance. It is fully booked & those attending can look forward to some good food, great live music, nice surprises & some fabulous decorations (which reflect the fact the the 16th is also Chinese New Year), expertly devised by Bev McKenna & Vanessa Cloete. In my capacity as social organiser, I have been scrutinising the club’s wine offerings. I was very surprised (to say the least) to learn that there is a wine list! It must be the club’s best-kept secret as I have never seen it…and neither has anyone else I’ve spoken to in the last few days. I will endeavour to ensure that it is displayed on the bar in time for Friday’s event…and remain as a permanent feature. I am also undertaking to improve the quality of wines available – not necessarily a longer list, but a wider variety to suit most tastes & pockets. Seems crazy to stock no less than 6 kinds of Arabella wines when they are not generally favoured by many members. I have a couple of ideas up my sleeve & I’ll keep you updated on progress. I’m very pleased to announce that we have a brilliant new Behringer Europort sound system at the club – a portable & versatile Bluetooth amplifier/control unit, microphone & two 1000watt speakers (yay!) This will enable us to hold a wider range of social events. So, John Stavers & I are working on a Music & Leisure Quiz on Friday 16th March. Poster & entry sheet will be put up on the notice board in a week or so. There will be a ‘meet & greet’ function with drinks and snacks for all new members after golf on Thursday 1st March. 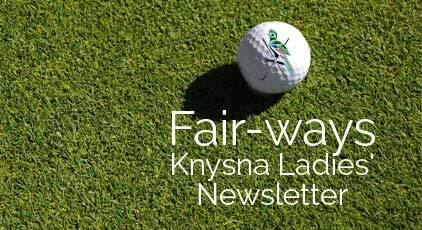 Please stay behind to welcome our new ladies – and hopefully arrange a round of golf with them. Please feel free to contact any one of your Committee members should you wish to address an issue, put forward an idea or even…a compliment. Any suggestions as to what should be included in this newsletter are welcomed. You can contact Marion Mack direct on 076 730 3321.